Color Guard Yucca is a small to medium sized evergreen shrub which can be grown in all but the northernmost parts of the United States. 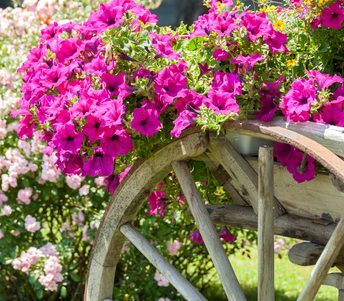 Gardeners will often plant it in the foreground of beds with larger shrubs, by itself in dry areas, or in containers. It does well planted on dry slopes or as a border. This is a bold and eye catching plant with striking yellow color throughout the summer, turning shades of red-pink in the fall and winter. The Yucca is distinguished by its long, sword like leaves, which are about 1 to 1 ½ inches wide and culminate in a sharp point. The trademark yellow color is seen running through the center of the leaves. Clusters of showy white flowers appear in early summer, hanging off of stems which grow up from the plant. One of the main reasons people buy this plant is because of its great durability. One of the best you can buy, the Color Guard Yucca thrives in dry conditions with virtually no maintenance. It will reach a height of up to 3 feet tall and 2-3 feet wide. Water requirements are very low for this shrub once it is established. As a result, it will survive on rainwater alone, and will do better in a dry area. 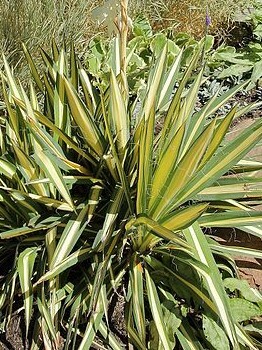 The Yucca grows best in full sun, but can also tolerate partial shade. Water conservation is an important issue today, and Color Guard Yucca checks the boxes of plants which need hardly any moisture, that can be grown in almost all climates, and require very little maintenance. In addition it is a very beautiful plant.